I made my own pillows. I MADE MY OWN PILLOWS! The other day I went out and I bought a sewing machine because I felt like buying a sewing machine. I shopped around down in the fabric district and thanks to my google phone, I was able to show a store how cheap this exact sewing machine was somewhere else and then get it for only 100 bucks. 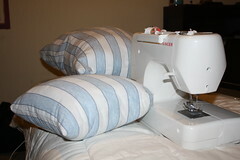 Then I went out and bought fabric and pillow stuffing, and spent the day teaching myself to make these pillows. You’ll notice I put the lumpy one in the back so you can’t really see it, but the one in front looks totally legit, right?! I’m going to make more. It was fun. I think I’m really into crafts. « I LOVE NEEM EVEN MORE!!! Brilliant work! When are you going to start your own clothing line then?! My dad made me sew him pillowcases OUT OF ORANGE BEDSHEETS HE HATED. Haha.